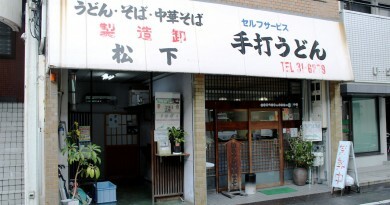 Baka-Ichidai is a popular Udon restaurant in the east of central Takamatsu, close to the Hanazono Kotoden station. 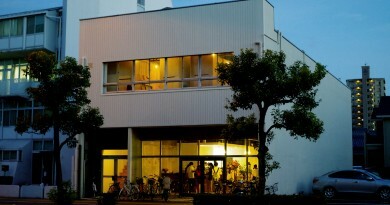 It’s not far from other places of interest such as crafts shops or accomodations. 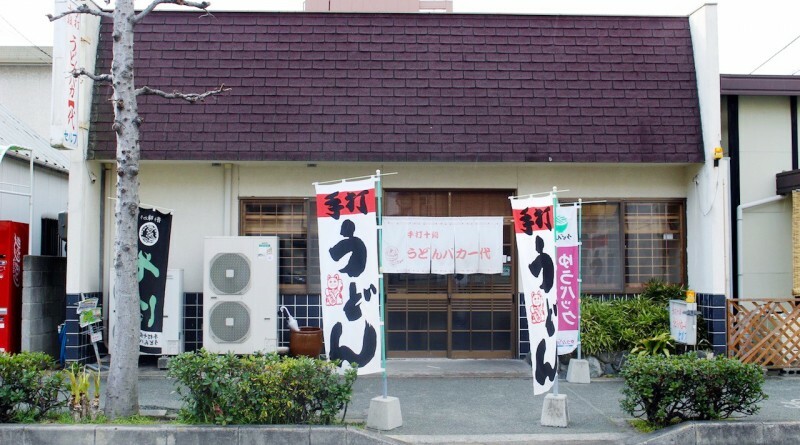 If you’re already in the area, why not check out one of the most famous Udon restaurants in Kagawa and eat its genuine and tasty Udon? 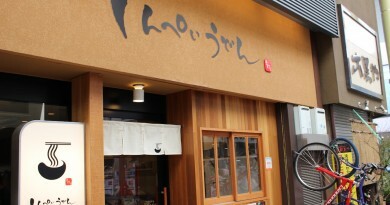 The restaurant is open from early in the morning so you can experience breakfast Udon, even before going for a trip or sightseeing. 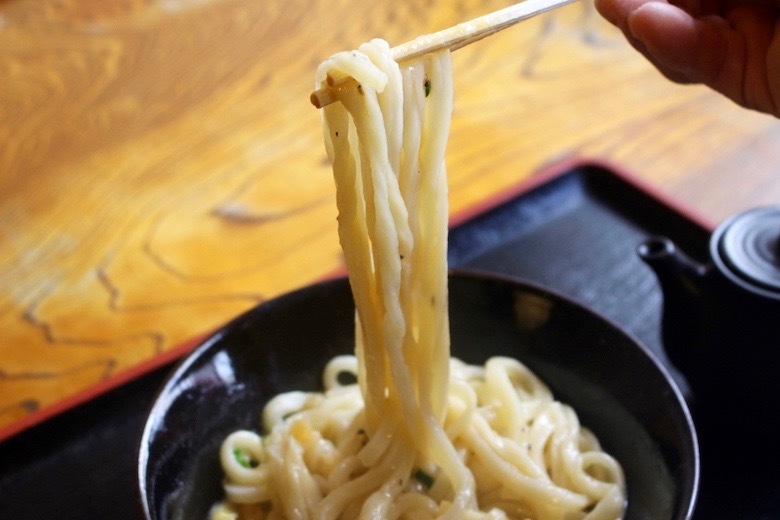 The reason Baka-Ichidai is so popular is that tasty udon. 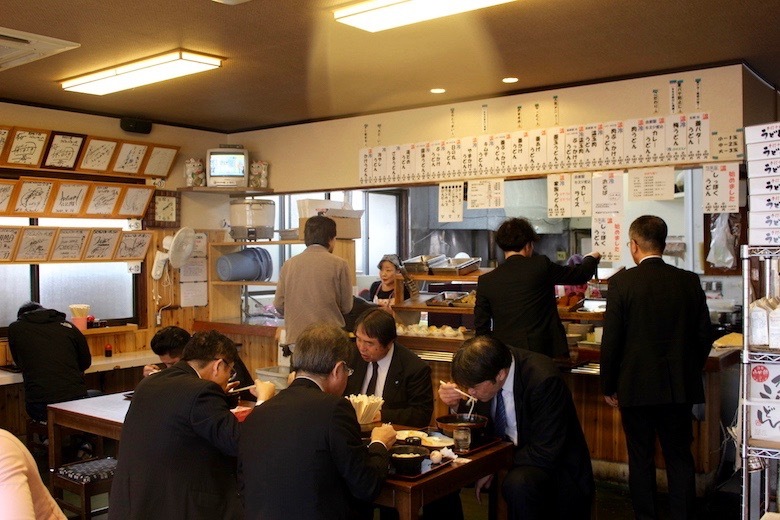 Especially, the Kama-butter which is the special menu here is so delicious.The best things about this dish are that you always know that the udon are freshly made and instantly served to you. 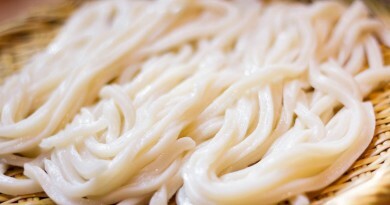 What’s different from the Kama-butter noodles is that they’re not getting boiled, cooled down and boiled again as it’s usually done. They skip the cooling down for this dish, which is why the Udon need to be eaten right away. Since Kama-butter is Baka-Ichidai’s most popular product we would like to tell you more about it. You’ll get the dish, the noodles, topped with black pepper and butter and an egg on the side. You break the egg open and put it on your udon. After that, you add some of the special soy sauce of Baka-Ichidai and it’s ready to eat. You may notice a resemblance to the Italian carbonara here, but this carbonara definitely gives it a Japanese touch! 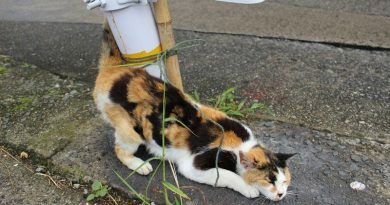 Since every Udon restaurant is a bit different, we’d like to introduce you to the way of how to order at Baka-Ichidai. At first, get a tray and your water, if you’d like some, on the right side. 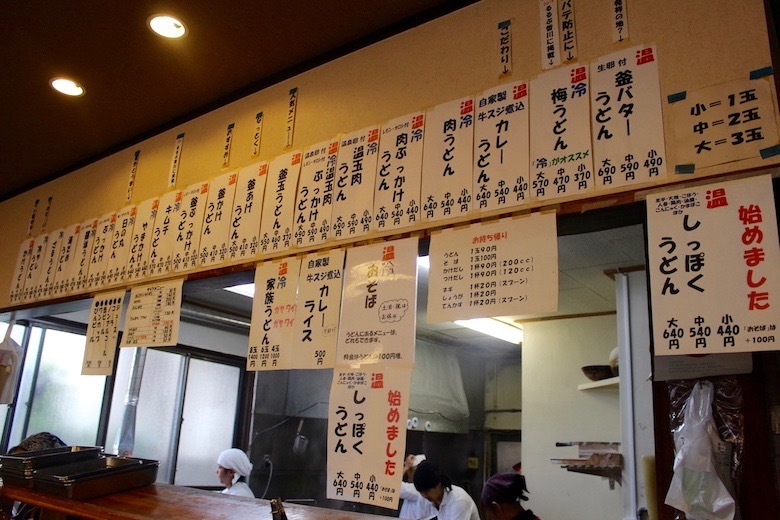 As you can see here, there are lots of different dishes available and even for Japanese people it is rather confusing. It would be impossible to introduce all of the dishes, but have a look into our “Udon guide” article to learn more about what are the differences between the Udon types and the side dishes. 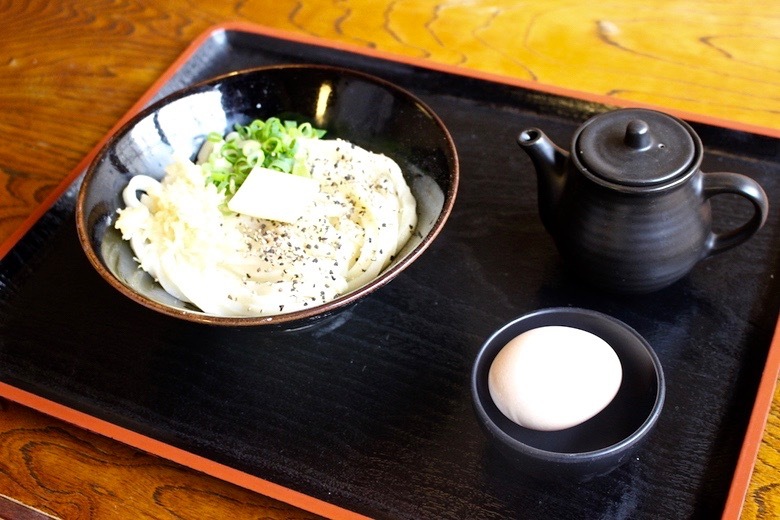 We propose you try the famous Kama-butter at Baka-Ichidai since it is not possible to eat it somewhere else, but they offer most of the normal Udon types as well. Next step are the toppings on the right and the side dishes on the left. 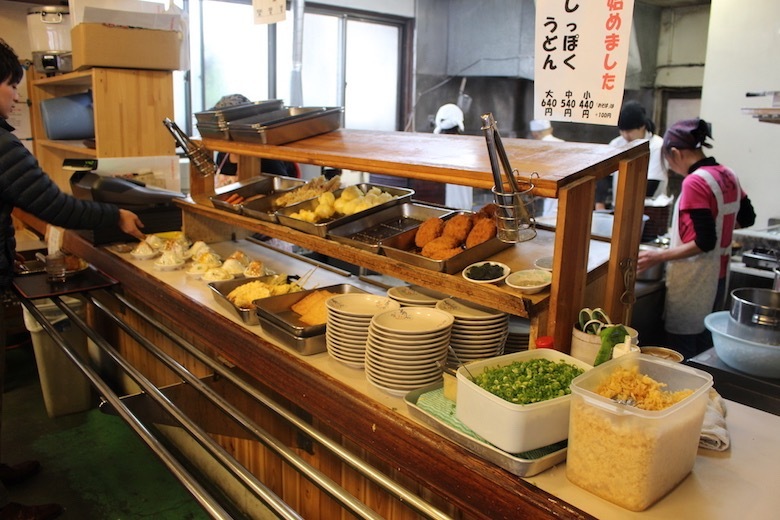 The toppings are always free, the side dishes, such as tempura, croquettes or rice balls will be paid together with the Udon at the cash register. All in one Udon souvenirs for your friends and family at home! 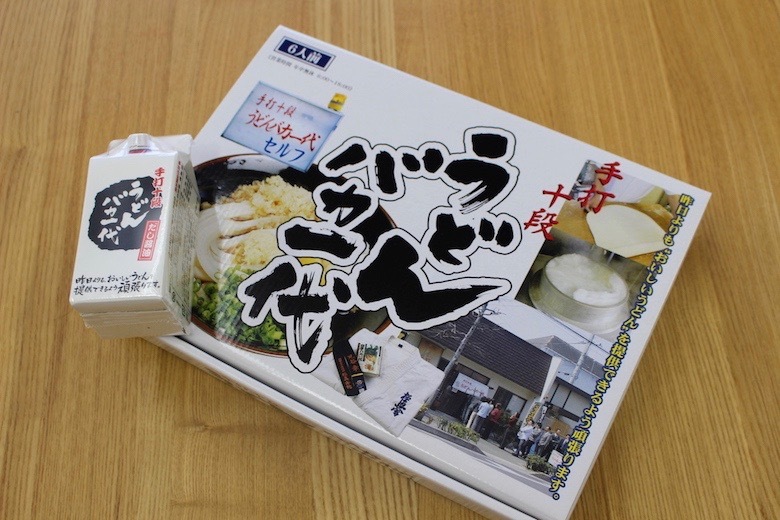 Baka-Ichidai offers their Udon as a souvenir, so you have the chance to bring back a special part of Kagawa’s very own culture back to your home country. In the center you can see the Udon noodles and on the left the broth in a bottle. Both ingredients are genuine Baka-Ichidai products and will be a guaranteed sensation back in your home country!